On August 17 federal judge Royce C. Lambeth ruled that the U.S. Fish and Wildlife Service’s designation of critical habitat for the federally threatened piping plover in areas of the Cape Hatteras National Seashore were in compliance with the Endangered Species Act. The ruling was in response to a suit filed by the Cape Hatteras Access Preservation Alliance (CHAPA). Defendant-intervenors in the lawsuit were Defenders of Wildlife and the National Audubon Society, represented by the Southern Environmental Law Center. The habitat will cover a little over 2,000 acres in Dare and Hyde counties including areas on Cape Hatteras, Hatteras Inlet, Oregon Inlet and Ocrakoke Island. Critical habitat for the imperiled piping plover has been a contentious issue along the Outer Banks for years. The U.S. Fish and Wildlife Service first proposed critical habitat for the plover in 2001. CHAPA challenged the designation in federal court and prevailed. The court said that Fish and Wildlife had not justified the designation and in 2004 remanded the action back to the agency to correct errors and for clarification. In 2008, Fish and Wildlife published its revisions and CHAPA sued again. This time, Judge Lambeth ruled that Fish and Wildlife had met all of its requirements under the Endangered Species Act. The piping plover is a small (bluebird-sized) shorebird. It is gray to grayish-brown above and white below. Males and females are similar in appearance. During breeding season they show a dark (black or brown) neck band (sometimes incomplete, especially in females), a small black bar across the forehead and a black tip on the tail. The black bands fade in the winter. The piping plover breeds on the Great Plains from Alberta, Canada to Oklahoma and along the northern Great Lakes and down the Atlantic coast from Newfoundland to the Outer Banks. Coastal piping plovers like the ones on the Outer Banks nest above the high tide line at the end of sandspits, on gently sloping foredunes, on sparsely vegetated dunes and in protected areas behind primary dunes. According to the U.S. Fish and Wildlife Service, major contributors to the decline of the Atlantic Coast piping plover include loss and degradation of habitat due to development and shoreline stabilization. The Service also states that disturbance by humans and pets reduces the functional suitability of nesting habitat and can cause direct and indirect mortality of chicks and eggs. When the Atlantic Coast piping plover, Charadrius melodus, was listed as threatened in 1986, the U.S. Fish and Wildlife estimated there were only about 800 pairs left. Today, thanks to an intensive protection effort there are around 1,500 pairs of Atlantic Coast piping plover. According to the U.S. 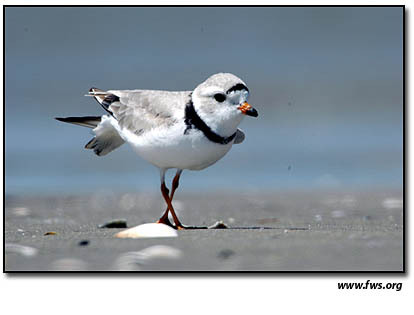 Fish and Wildlife’s Atlantic Coast Piping Plover Revised Recovery Plan the objective is to remove the plover from the Threatened list by increasing the numbers and productivity of breeding pairs and providing long-term protection of breeding and wintering habitat. The goal is to have at least 2,000 breeding pairs along the coast and maintain that population for five years.